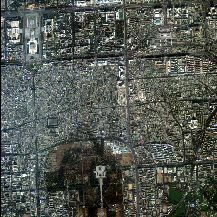 Satellite Image Map of TiananMen Square. 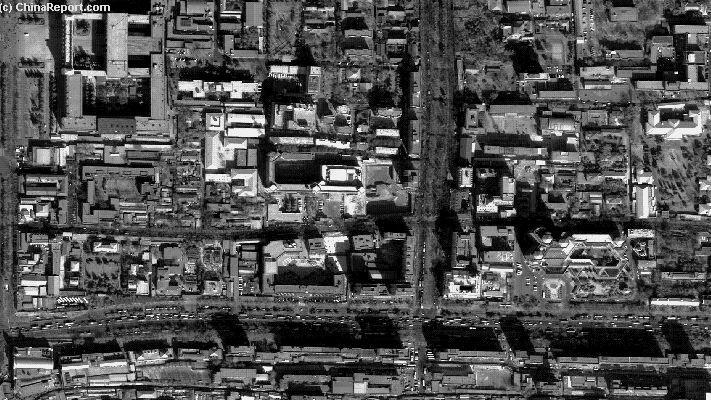 Third: a clear Satellite Image Based Map of TiananMen Square, Monuments and Directions. Beijing's Largest Park and wintertime ice-skating ring, the magnificient Beihai Park with Jade Island seen by a Satellite. Dongcheng District Full Map , includes entire District. From Beihai Park to Drum & Bell Towers, Yonghegong Lama Temple to Wanfujing, Oriental Plaza and Chang An Avenue. Same Map as Above but now Zoomed. A Combination Map of North-Eastern Beijing, depicting both Dongcheng and Chaoyang Districts. Wanfujing Shopping Street Immediate Area Map, Today's Number One Exclusive Shopping Street in Beijing- Wanfujing Street + immediate Area on a Map. Link through to a Full Introductionary Photo Report on Wanfujing Dajie' which includes a handy overview Map of the Area Scenes & Hot-Spots. A Birds-Eye View of ChongWen District + part of DongCheng- and Xuanwu-Districts. Dated 22-10-1999. This Satellite Image Based Map with very good Details includes a Short Explanation of 4 Major Areas Visible in this Image. First and Foremost: TiananMen Square and Monuments. Secondly, the Beijing Legations Quarter former Location of the Colonial Era Embassies. 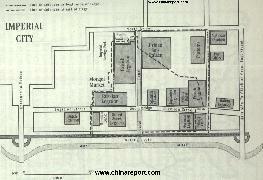 Thirdly, the extensive Chongwen District Hutong (and neighboring Hutong Area's), many of which are no longer in existance today. Last and Fourth on this Map is The Temple of Heaven and Park (Tiantan GongYuan) in the South of Chongwen, Not DongCheng District. Overview the DongCheng District from Beijing's Ancient Drum Tower ! Welcome to the Beijing DongCheng District Maps Menu at China Report.com / www.Drben.net. 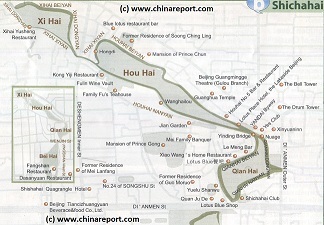 The Below Menu Page gives Quick and Easy Direct Access to Maps of Dongcheng District and Landmarks used in THE BEIJING REPORT, a part of ChinaReport.com. Three Complete Maps of The Beijing Palace Museum a.k.a. The Forbidden City in Beijing. 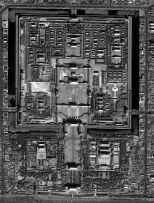 The First Map of the Palace Museum - Is a Satellite Image Overview of the Entire Palace and immediate surroundings. This Maps gives a quick Introduction to the Main Features as well as Links to Photo-Virtual Walks with More Information. The Second Map of the Palace - Is a Detailed Satellite Image with marked on it the Names of ALL Structures within the Palace Museums' Inner and Outer Walls. 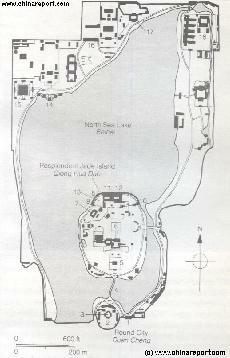 The Third Map - Is an Official Schematic Overview Map with the Main Features of the Museum provided by The Palace Museum of Beijing (2005). A Satellite Image Based Map of The Capital Hotel and Immediate Area in 2002 AD. 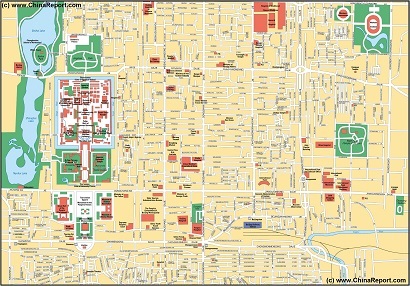 This Map shows a section of the Former Beijing Legations Quarter including the southern Part Zheng Yi Road (Former Canal Street), West Legation Street entire, and a Large Section of East Legation Street. The Capital Hotel was constructed in the 1980's and recently Expanded with a New Wing. It is the only 5 Star Hotel in the Former Legations Quarter Today. A Geographic Map of The Capital Hotel and Immediate Area in 2002 AD. This Map shows roughly the same area as the above Satellite Image of Capital Hotel and Area in the Beijing (Former) Legations Quarter. Names of Landmarks are included as well as main Facilities in the Area and where possible - changes to the QianMen Hutong Area that have taken place between May of 2005 AD and are ongoing into 2008. 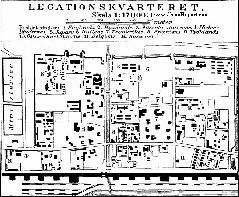 Short Summary of Streets in the Legations Quarter with their hostoric relevance is included ! Maps of Beijing Oriental Plaza - The Malls. Schematic Maps of all Three Commercial Floors of Oriental Plaza, the main luxury shopping mall in the Central Dongcheng District of the City of Beijing, located along Wanfujing Street and Chang An Avenue. 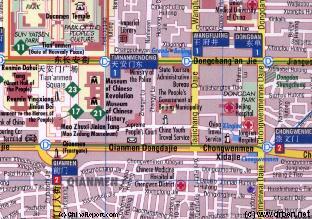 Dongcheng District Overview Map 02 - Streets of Central & Southern Dongcheng District. 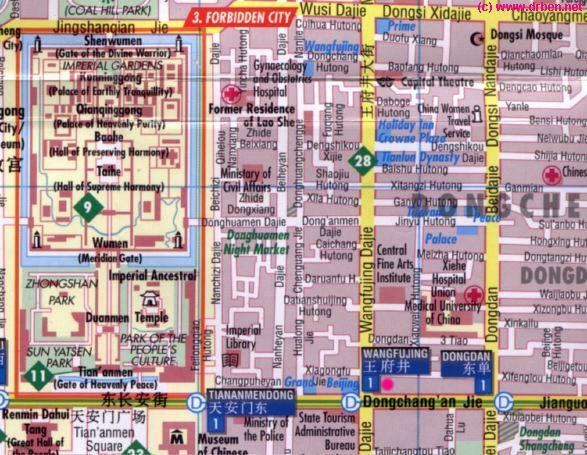 A detailed Map of all Streets and Alleys of Central and Southern Dongcheng District (and a part of the Chaoyang Central Business District (CBD)). The area depicted roughly covers all between Beihai Park North Gate in the north west, Chaoyang Workers Stadium in the north east, the former Grand Canal and the Golden Triangle of Guomao in the south east and Dashillar Street in Xuanwu District in the south west. Browse the Maps and follow the links to additional information, maps and photos on each location where available.